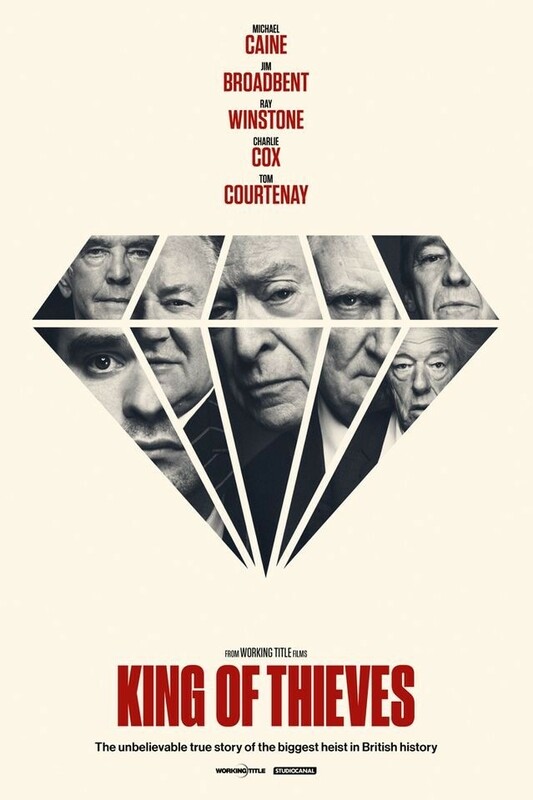 When I started my blog (all those three weeks ago) I didn’t envisage writing about a film but then I saw “King of Thieves” advertised about the Hatton Garden Heist and I thought it was worth a look and mention. So, on Tuesday night with Cineworld card in hand, my partner and I headed off to our first unlimited card screening experience. – Anyone else have a Cineworld unlimited card? We love ours and are always at the cinema. A little recap about the Hatton Garden Heist… It took place over Easter 2015 and £14 million in diamonds, gold, jewellery and cash were stolen from over seventy safety deposit boxes by some older career criminals with colourful pasts out to do “one last job”. (Some sources quote up to £200 million but I am sticking to the figure shared at the end of the film). The entertainment industry has used the heist as a source of inspiration, I hadn’t realised there has already been another film released in 2017 called “The Hatton Garden Job”, it has been featured in an American investigation series, plus it looks like there may be a four-part mini-series making its way onto TV at some point too. When writing this I wondered what to share, as I didn’t want to be accused of any spoilers, but having watched the film, and looked back at coverage of the event, I was very surprised at how closely the plot has stuck to the actual events! From conversations that were recorded by the police via listening devices, to one of the characters reading “Forensics for Dummies” at the kitchen table, which I laughed aloud at during the film not realising the book had formed part of the evidence! Where the film varies from real life is probably within the cast and characters themselves. It was a great cast of older generation British actors playing (very good) versions of themselves, apart from Jim Broadbent. For me, Jim’s was the standout performance of the film. Let me know what you think of the film if you are going and see it. PS. I’ve popped the links below to some articles and sources I found useful/interesting when writing this post.